Feedback: 6 comments - leave yours! 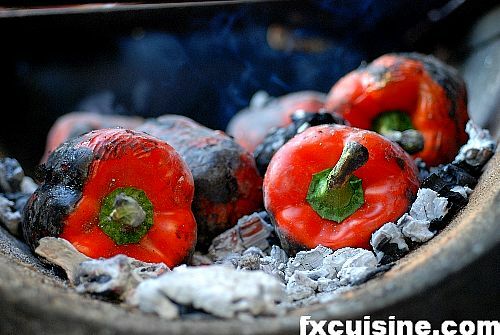 By placing peppers or other vegetables directly in a bed of white hot embers, they acquire a unique flavor. 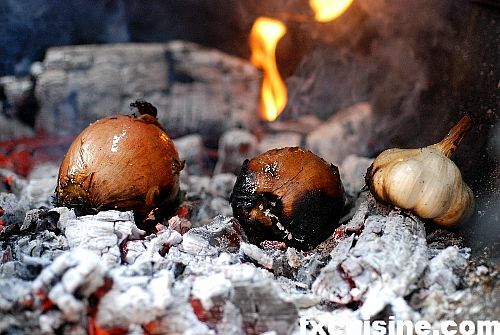 Some parts are almost charred while the rest remains soft and juicy - cooked in its own juice and protected by the peel. 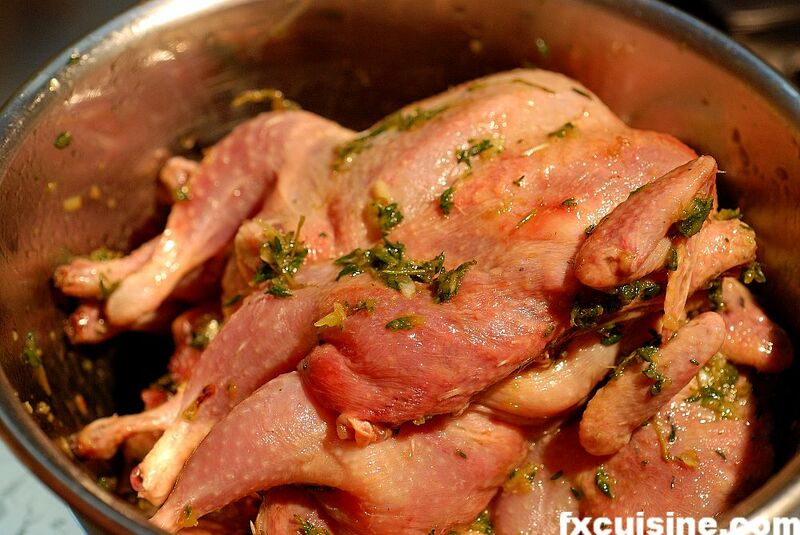 There is just no way to obtain such flavor in an oven. Yesterday I served such ember-roasted red peppers on a bed of polenta with grilled butterflied quails marinated in thyme and garlic. 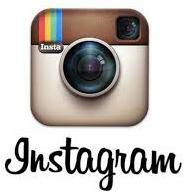 See how it works! The meal cooks by itself and requires very little skill or effort provided you plan it ahead. Start by preparing the marinade for the quails. You can substitute this with Devil's Chicken for even better results. 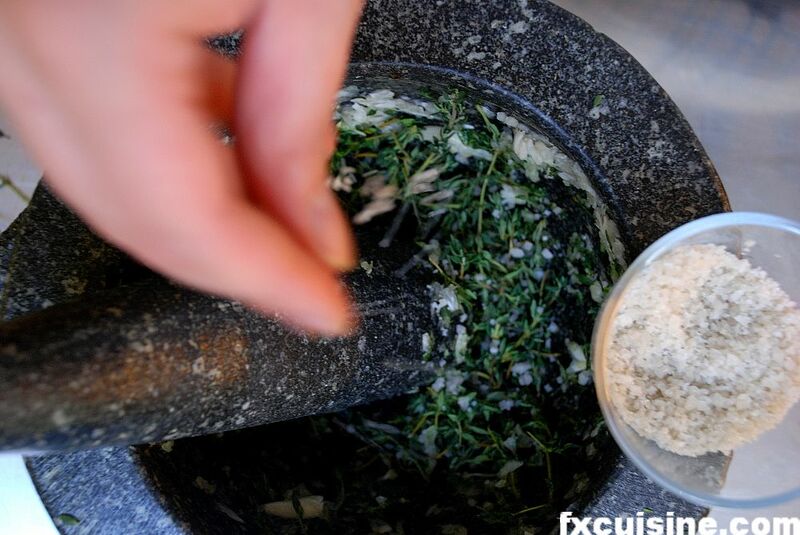 Prepare the marinade by crushing 10 garlic cloves with a bunch of thyme in a mortar. Add a pinch of salt and 2 dl olive oil. Butterfly 6 quails by cutting them through their backbone and flatten on a board. Wash and remove any remaining entrails. 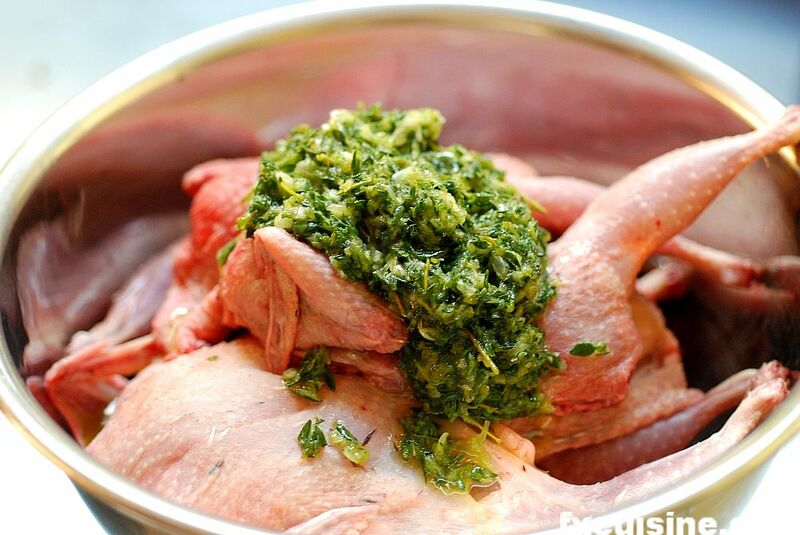 Put in a freezer bag with the marinade, rub it in and leave at least 30 minutes and up to 12 hours. 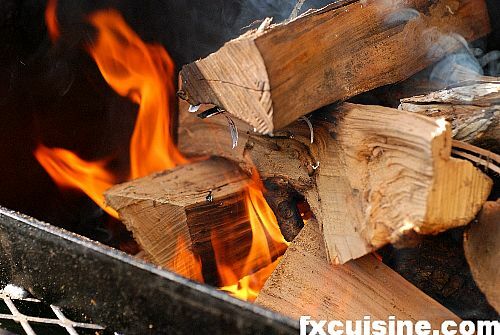 Prepare the embers by burning hardwood for about 40 minutes or until you get a bed of black embers with a little grey ash on top. You can also use pure wood charcoal but please no briquettes or anything that contains additive or it will ruin your food. Start the fire with alcohol or wood chips but no gasoline or newspapers as these would leave their bad flavor on the embers and your food. While the fire burns, prepare the polenta. In a heavy-bottomed saucepan, heat 2 liters mineral water with a teaspoon of salt. 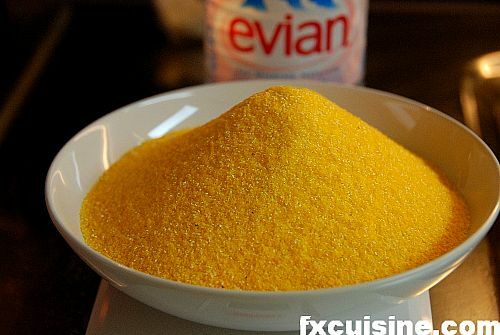 When lukewarm, pour in 500 gr polenta and mix vigorously. Bring to a boil while continuing to mix, taking care not to get burned by projections of hot polenta. Lower the flame to the minimum, mix again and cover. 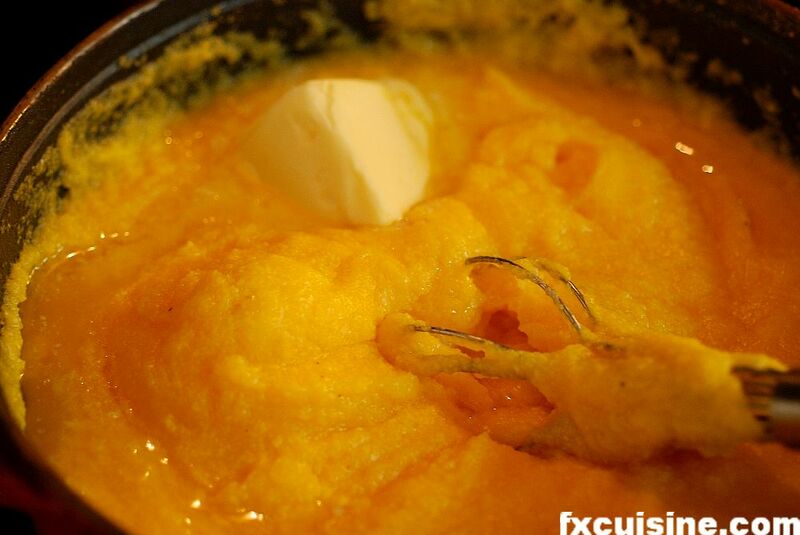 After about 60 minutes your polenta should be cooked through and fall off from the sides of the pan. Mix in 50 gr butter and as much grated parmesan as the doctor will allow. When the wood has burnt down to embers, shovel them into an even layer. Throw the peppers in the embers. The more embers around the peppers, the better. 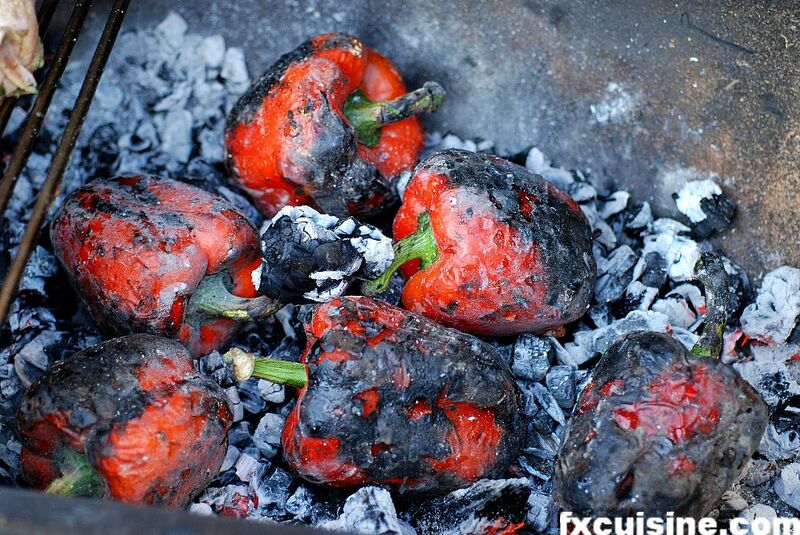 If you have enough embers try to bury the peppers in embers. Turn the peppers regularly until they are charred on every side. You need to go for big patches of black skin. 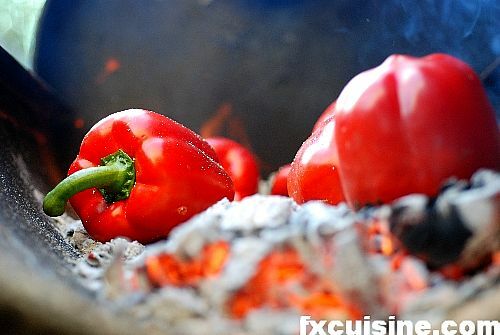 Do not worry about burning the food as the skin will be peeled off and the peppers are still juicy inside. You can roast all sorts vegetables in embers. Here are some garlic heads and whole onions I roasted the other day in just the same way. Shovel the embers into a thick layer and place a cooking grate on top. 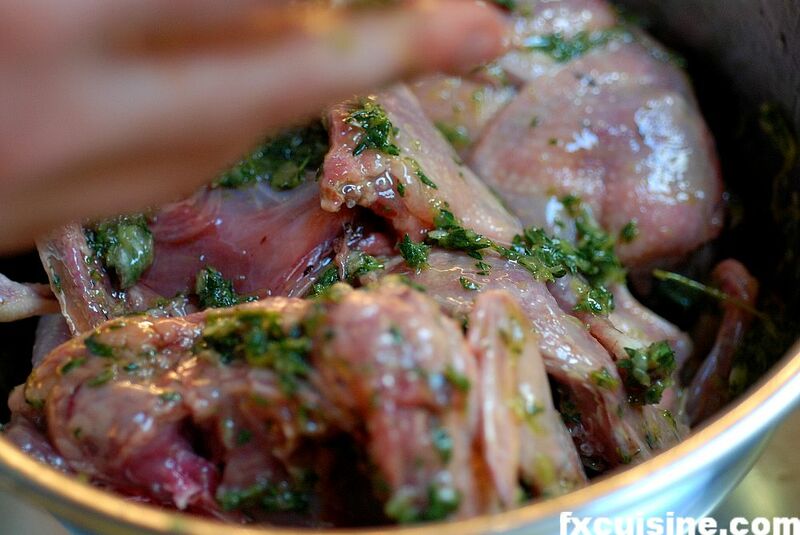 Lay the quails on the grate skin side down for about 5 minutes or until they are nicely marked. 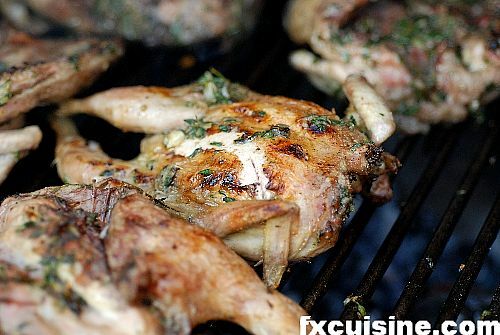 I recommend you put enough embers underneath the quails and blow some air to heat it up. 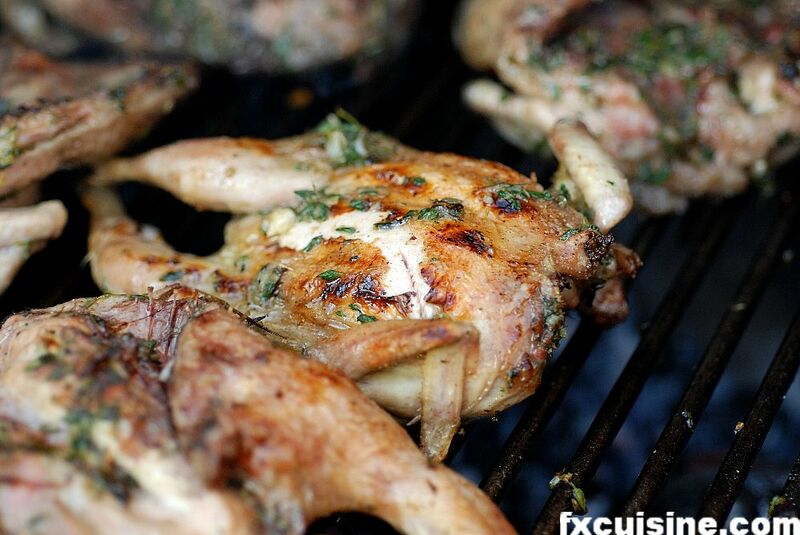 Turn the quails around and leave until cooked through. 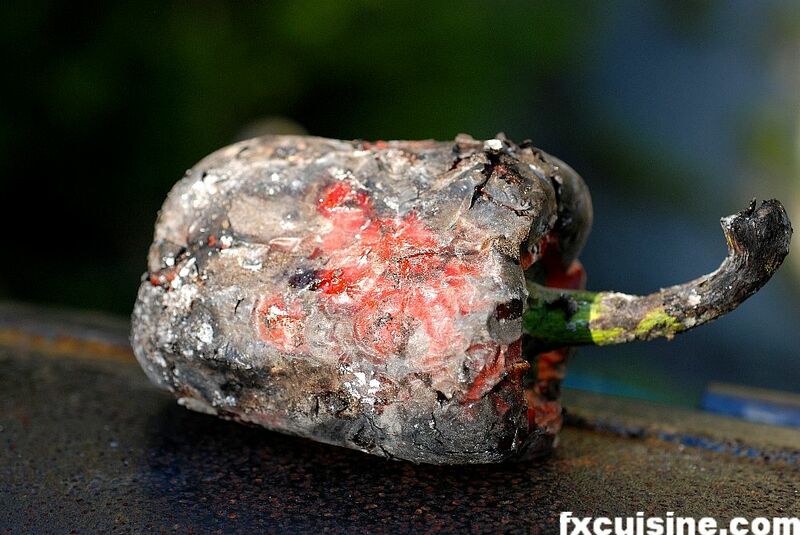 You can do this while the peppers cook but only if you have enough embers. You can't cook the birds over the peppers - there won't be enough heat and they'll be dry as pemmican by the time they are cooked through. While the quails cook, we prepare the peppers. They are all covered in ashes but don't worry - you are only a step away from a most delicious and memorable meal. 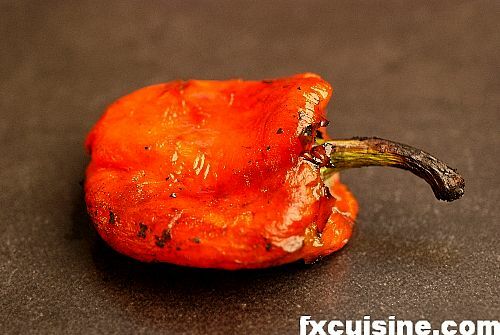 Using your fingers, peel off the peppers skin. If it doesn't come off easily, just put them for 10 minutes in a heat-resistant plastic bag or in a covered bowl. 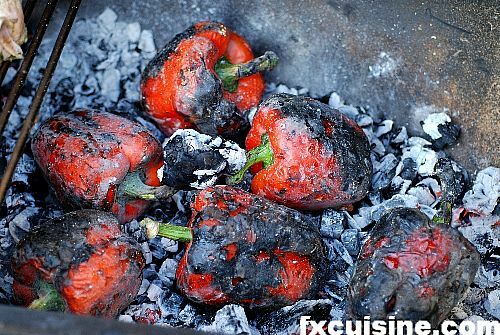 Make sure as little ashes as possible remain while abstaining from washing the peppers. That would wash away the flavor too. 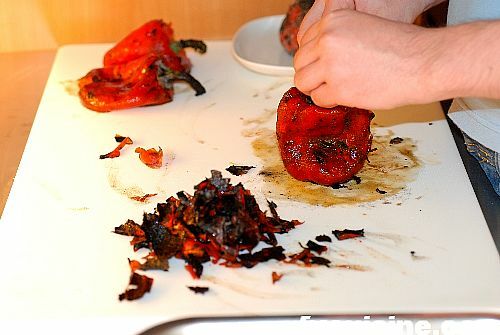 The peeled peppers can be served whole or deseeded and cut into strips. 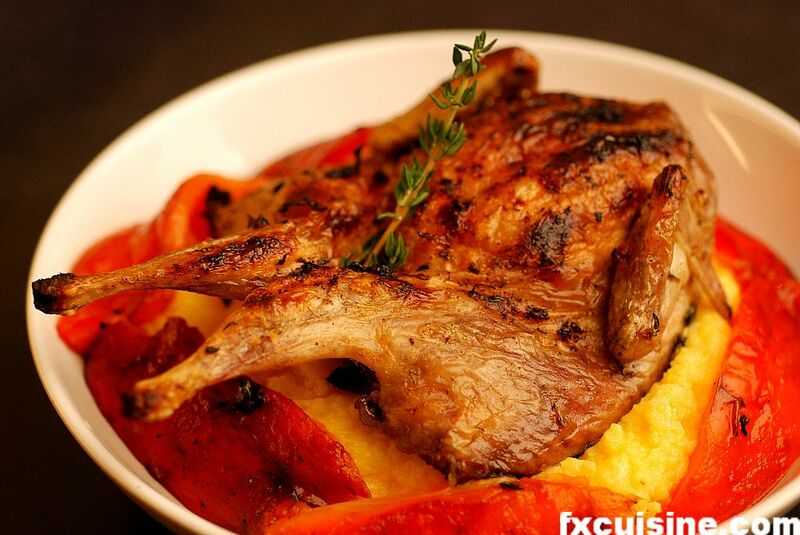 Serve over a bed of polenta with a butterflied quail and the peeled peppers cut into strips. This recipe comes from an amazing American cookbook called The Magic of Fire. 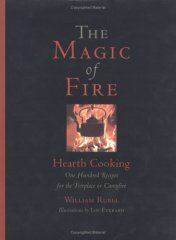 The author has done a lifetime of research cooking in open earths and over or directly in embers. This is one of my 20 favorite cookbooks and I have several hundreds cookbooks in 6 languages. You need to get this book - the recipes are all traditional and yet immensely original. Mr Rubel (www.williamrubel.com) is a Californian home chef versed into literature and gastronomy. He cooked some of his dishes at Chez Panisse, one of America's top restaurants, and yet most recipes use only a handful of ingredients. A really unique and inspiring book, warmly recommended. The only thing missing from this book are pictures - I hope my modest effort will somewhat complement that masterpiece. You could try to use the peeled peppers as salad adding salt, chopped onion, oil and vinegar. It's fantastic! Neenah, thanks for visiting and I agree of course with this delicious way of preparing peppers. The vinegar balances nicely the roasted peppers' bland sweetness. Francois,If these open fire roasting pictures are your "modest" effort,please email me when you decide to do it really right!I already had ordered Rubels open fire book before finding this merely modest presentation. 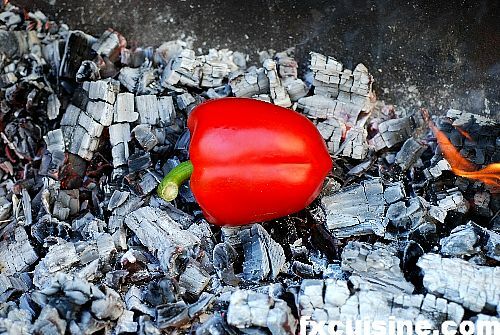 Don, I'm glad you liked the peppers-on-embers and I wish you great fun with Mr Rubel's book! I certainly have many plans for fireplace cooking and they should, if they work, be more spectacular than this!